Most of my story ideas start with a character. Inspiration can come from all sorts of places, especially from the animal world. 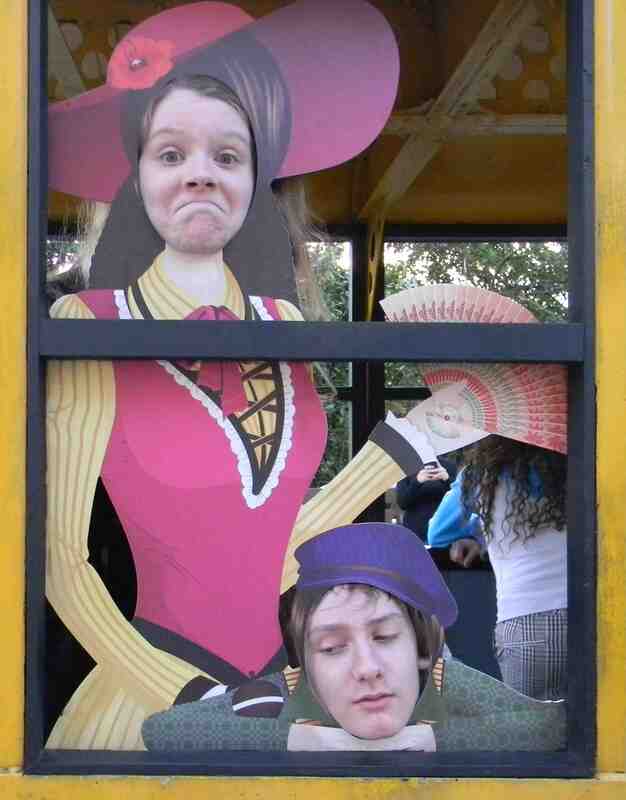 Did the picture above make you laugh? 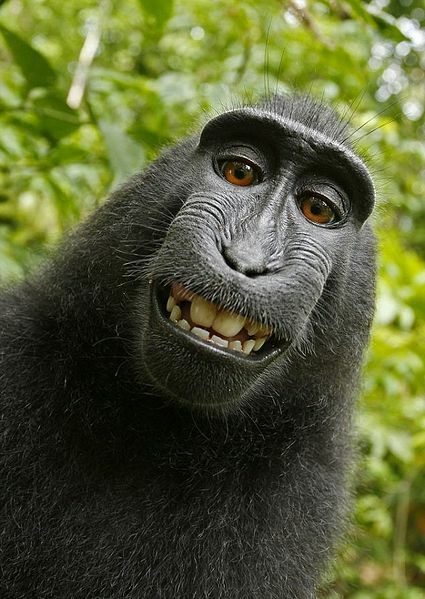 Can you imagine the sort of personality this macaque monkey might have? She is clever, for one thing, since she figured out what a wildlife photographer was doing and grabbed his camera to take this self-portrait! If you were writing a story about her, what would you call her? Once you have a name and some idea of what your character is like, you can start thinking up a story. 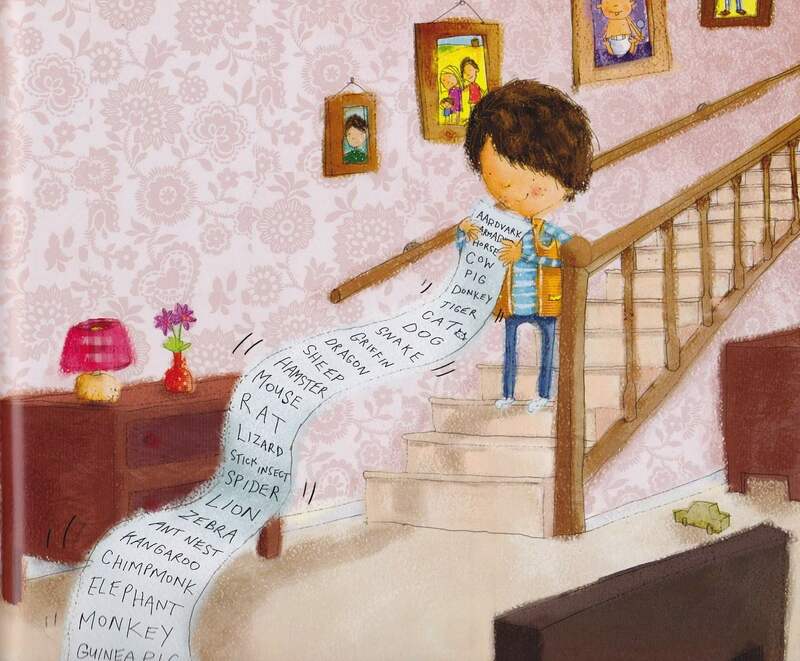 What other sort of mischief might Millie the macaque monkey get up to? I think she would definitely be a naughty character, so she is bound to get into trouble! But because she is good at heart, everything would work out okay in the end. What about this guy? He looks a bit mean, I think. 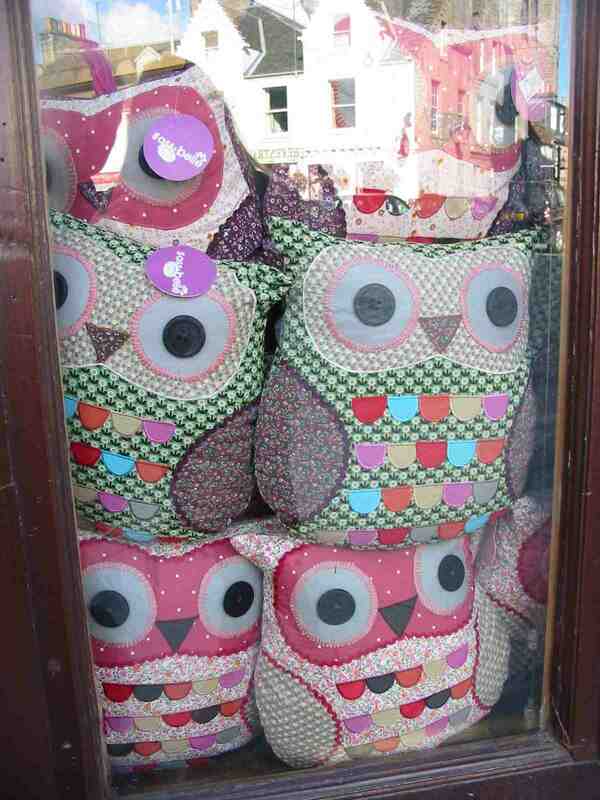 I would call him Orville and make him bad-tempered and rude. 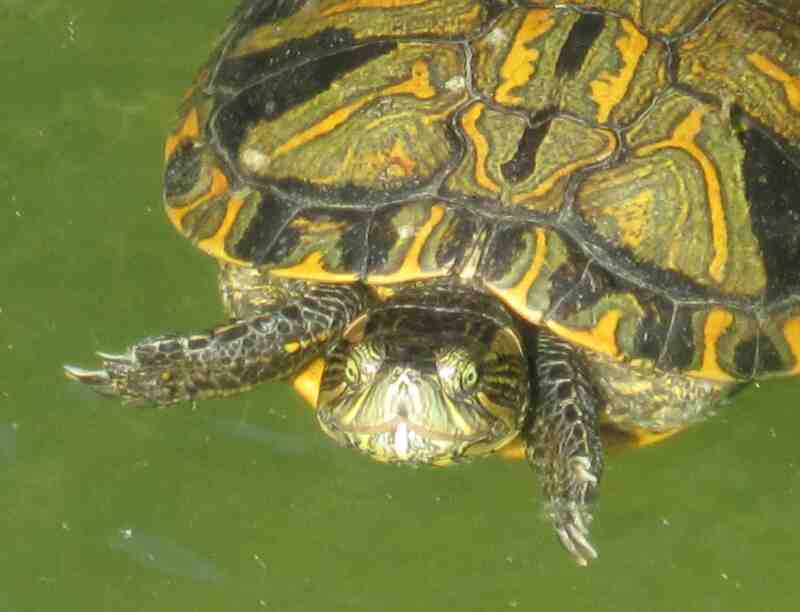 And that is because he is hard and scaly and has a mean expression. Perhaps in reality he is a very sweet tortoise! Here is another interesting individual. 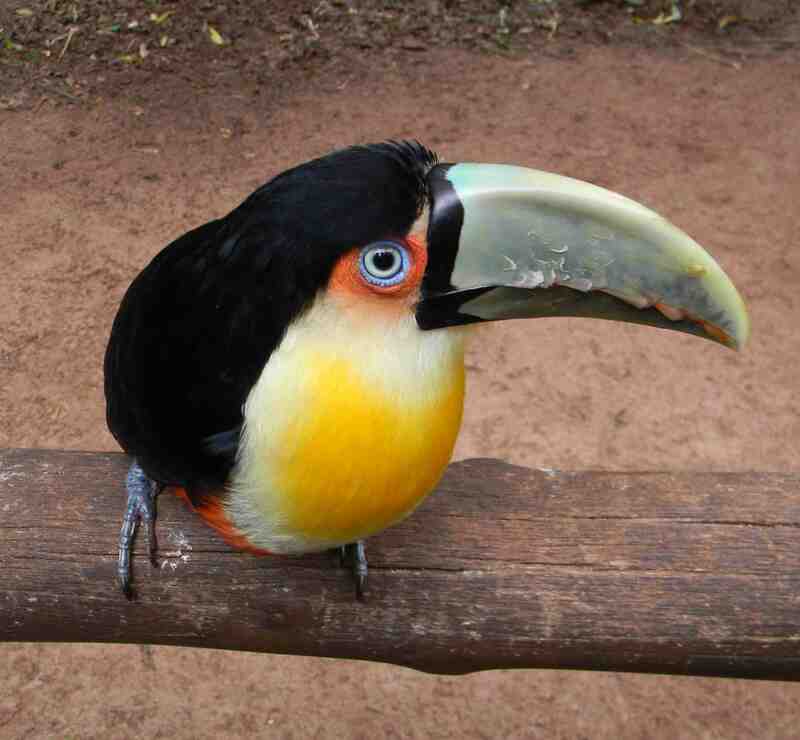 He is a type of toucan with intense blue eyes that stare unblinkingly at you. It’s hard to work out what he might be thinking. Is he friendly, or will he bite your finger? The shape of his beak makes him appear to be frowning, and it looks hard and sharp. His blue claws are also a bit scary looking. What sort of story might you write about him? Perhaps he feels misunderstood and really wants to be a tap dancer! A while ago my family and I were stuck in the middle of nowhere when our car broke down. We found a place to wait for the AA man to come and rescue us, and took some pictures of this surprising sign. 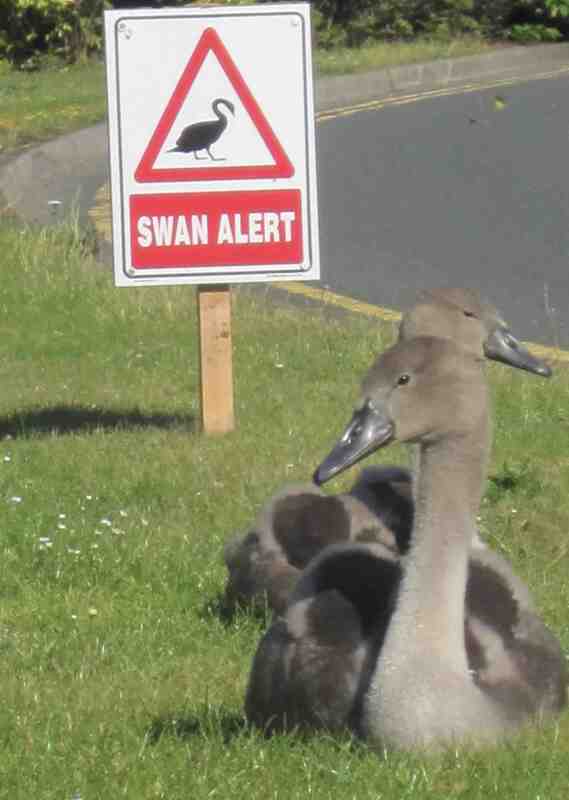 Adult swans can be quite aggressive, so someone must have put up this Swan Alert because of the baby swans (cygnets). A mum will always protect her babies, so it was a warning for people not to get too close! Perhaps that might inspire a story about a mother swan and her little ones. Here’s something you don’t see every day. 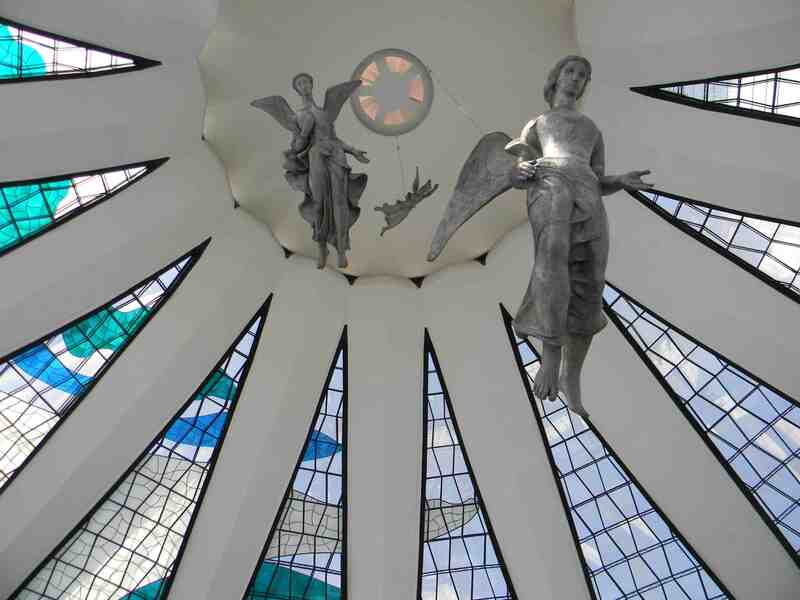 These angel sculptures are suspended from the ceiling in the cathedral in Brasilia, the capital of Brazil. Thanks to Doctor Who, they remind me of the weeping angels that get closer and closer with their big fangs each time you blink! They look like they’re swooping down ready to pounce. But if you look at their faces, these angels seem sad, as if they are caught on those wires, suspended in mid-air and unable to escape. Perhaps they are gentle, unhappy angels after all. What do you think? 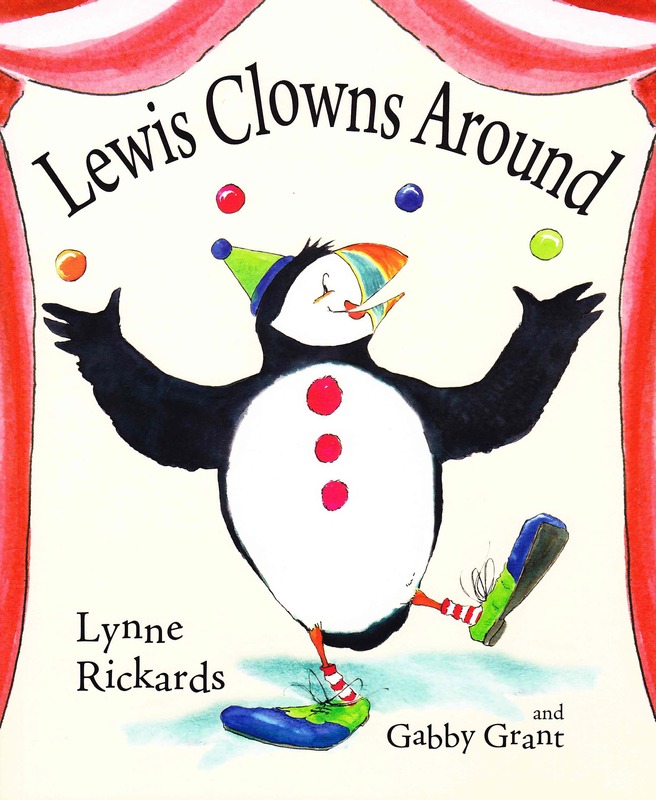 I’ve already told you about my first puffin story, Lewis Clowns Around, published by Floris Books. 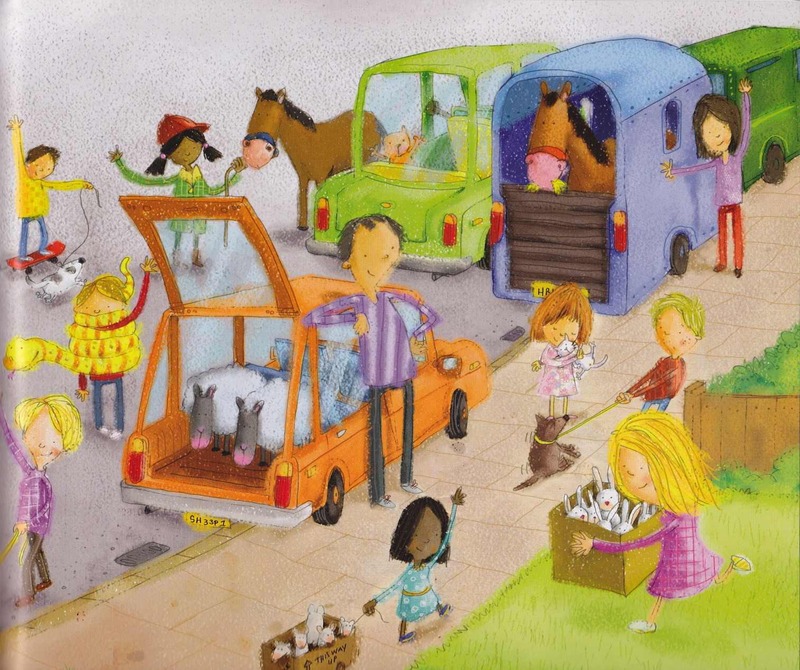 Since authors rarely get to choose the illustrator for their books, I was very pleased to see the first sketches Gabby Grant did of my little puffin Lewis and all his circus animal friends. She has such a talent for capturing their comical charm, and I was absolutely delighted with the finished book. Gabby is now working on my new puffin story, which is all about Lewis’s brother Harris. Unlike Lewis, Harris is quite happy being a puffin, but he is a bit lonely now that Lewis has flown off to join the circus. He decides to embark on his own adventure in search of new friends, and he finds lots of them! In this book Gabby will have to create not only puffins but seals, dolphins, fish, guillemots, otters and more! The new story is called Harris the Hero, and it will be published by Floris in the spring of 2013. I thought it would be fun to give you a little sneak peek of some of the beautiful illustrations Gabby has done so far! 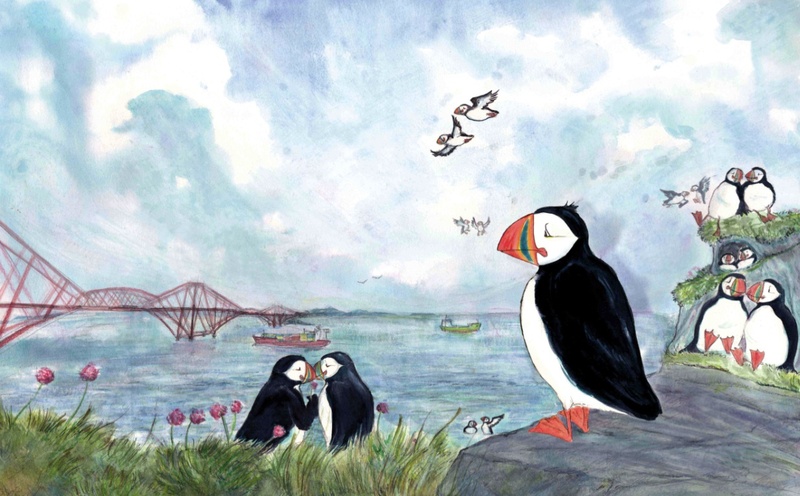 In this first illustration, Gabby shows Harris looking sad and alone with all the other puffins paired off around him. In the distance you can see a famous Scottish bridge, the Forth Rail Bridge, which goes across the Firth of Forth. The bridge is marked on the map below with a little red line near Queensferry, so you can imagine exactly where Harris is standing in Gabby’s picture. Harris lives near Anstruther on the East Neuk of Fife. 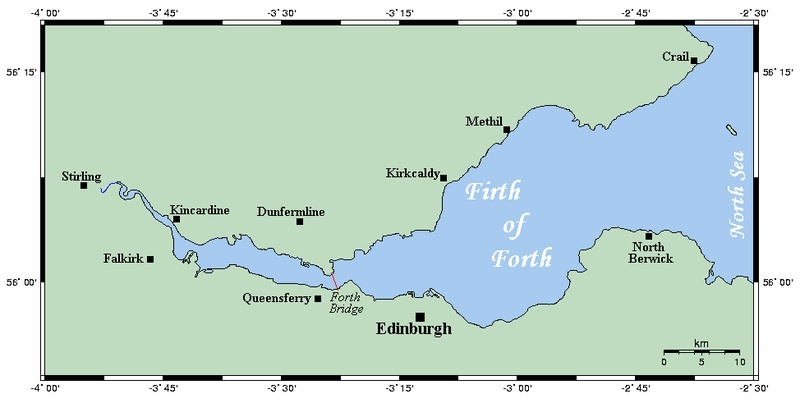 Below is another map showing the same area, with Anstruther marked just below the words East Neuk. 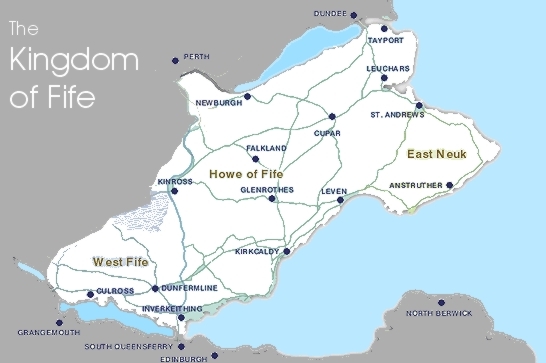 The Kingdom of Fife (the only “Kingdom” left in Scotland) is lovely and green with pretty villages along the coast. 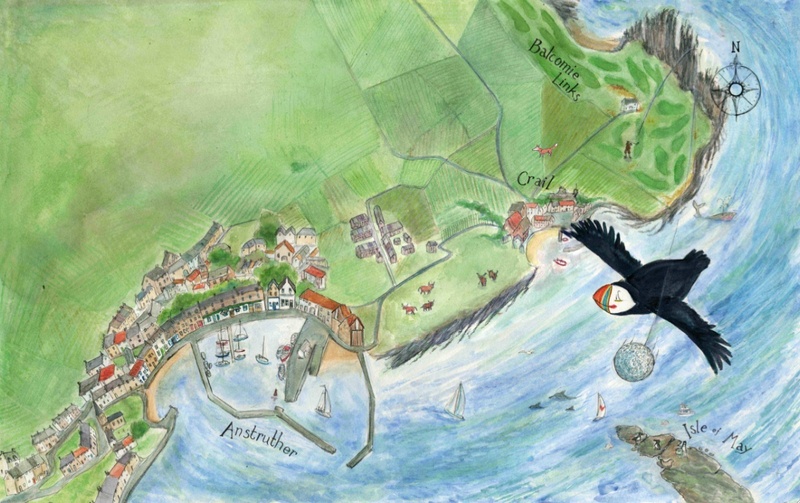 In this beautiful watercolour you can see the little village of Anstruther with sailboats in the harbour. And look – someone on the golf course at Balcomie Links has nearly hit Harris with a ball! 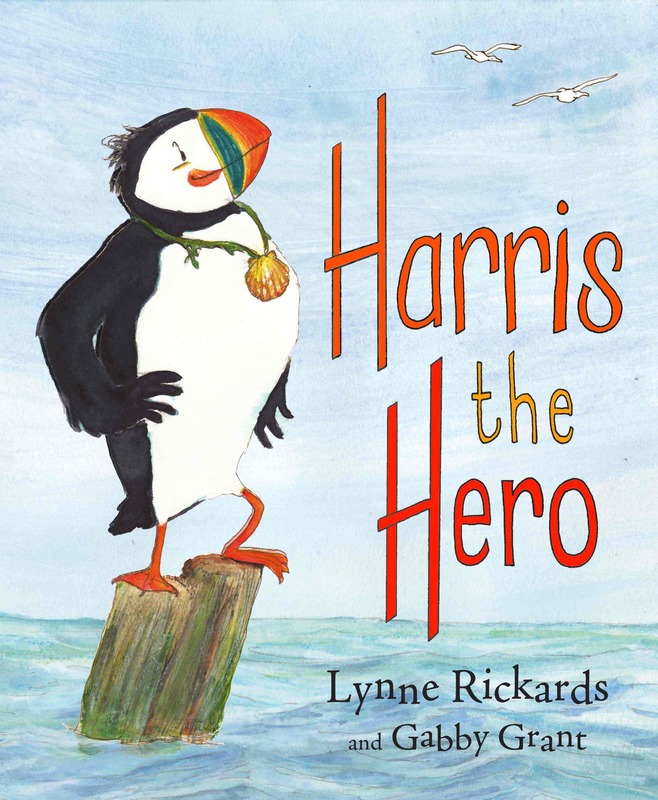 Later in the story Harris comes to the rescue of a baby seal who has got lost. The poor thing is clinging to a buoy in the harbour and Harris helps him find his way back to his mum. 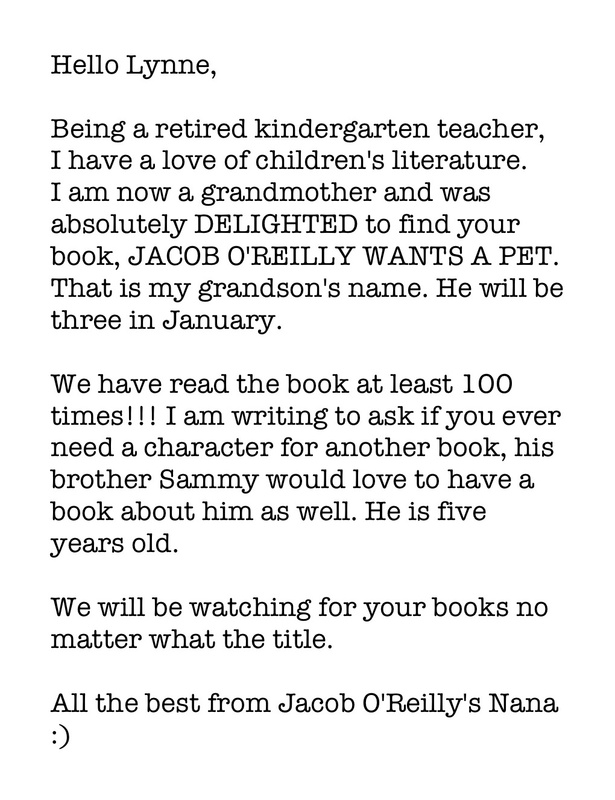 The other day I got a fantastic message from a lady who signed her letter, “Jacob O’Reilly’s Nana.” You can imagine how pleased I was to learn that there is a REAL Jacob O’Reilly out there who loves my book! 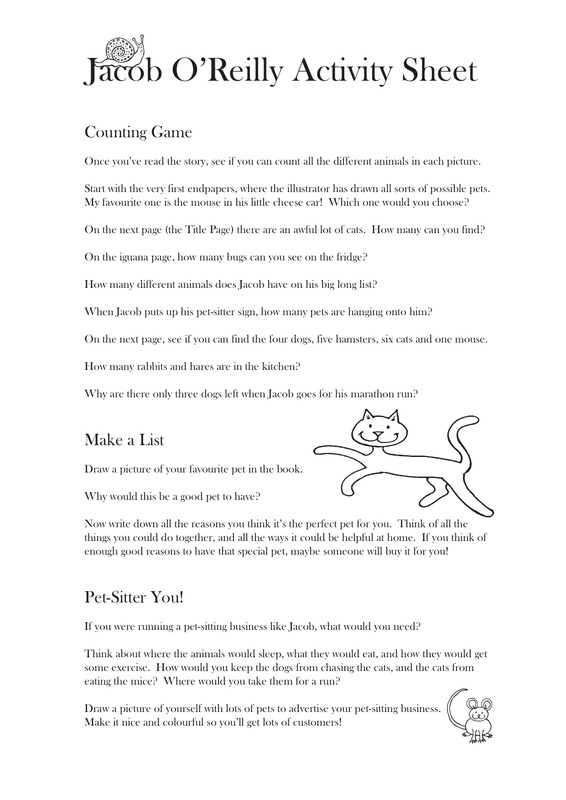 Jacob agrees to his parents’ idea of looking after other people’s pets, and puts a big sign outside his house: “Pet Sitter Jake at your service.” Soon his house is swamped with dogs, cats, hamsters, rabbits, sheep, a horse, a zebra and a rather big snake called Morris! He has a tough time feeding, cleaning and exercising them all, and after two weeks he is very glad when the owners all come back to collect them. 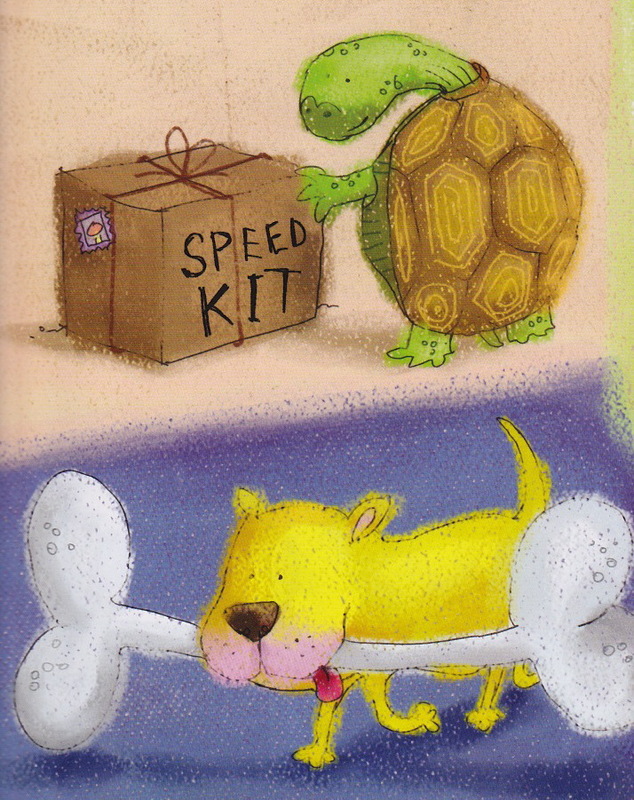 I love the illustrations by Lee Wildish which are so colourful and fun! He’s come up with all sorts of great pets for the endpapers, too. 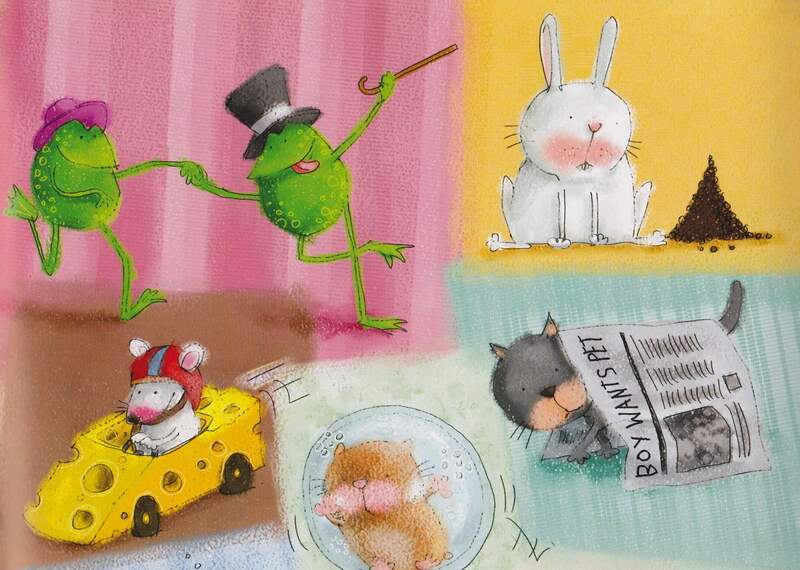 Here you can see a turtle, a little yellow dog, some dancing frogs, a rabbit, and my personal favourite, a mouse in a cheesy racing car! 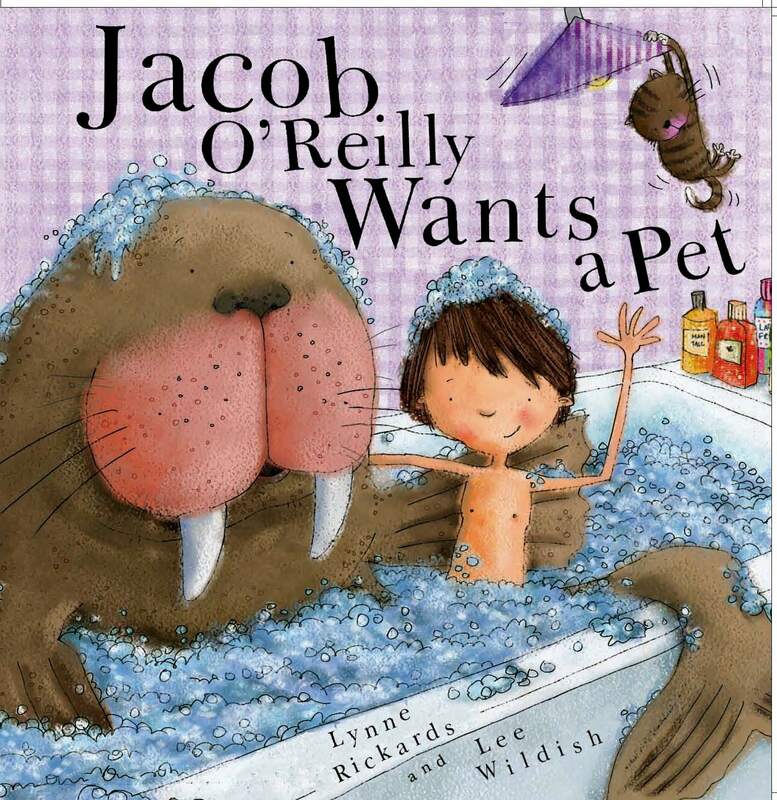 I thought the real Jacob O’Reilly (and my other readers) might like to try some of the fun activities I have put together to go with this book. 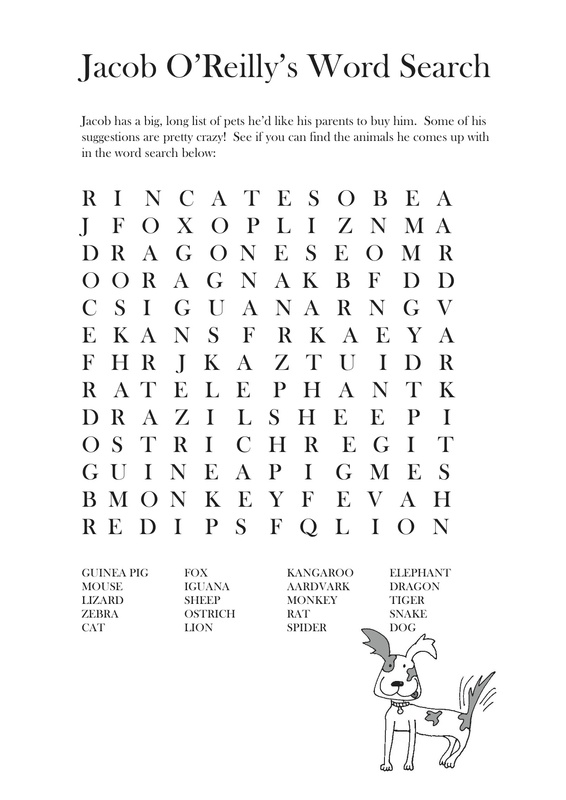 If you click on the images below you should be able to print them out at home. I think the real Jacob O’Reilly may need a bit of help from his Nana to do some of these activities, since he is not quite three. Maybe his big brother Sammy can help too. Have fun! How do fruit and vegetables grow? This morning on the news I heard that many children (and some of their parents) are unsure of how the fruit and vegetables we eat actually grow. It’s not all that surprising, since most of us only see fruit and vegetables in beautiful and colourful displays at the supermarket. Unless you have a garden or an allotment and grow your own, you won’t get a chance to see anything as it grows. Until now! There are three main ways a vegetable can grow. Some are roots that grow underground. 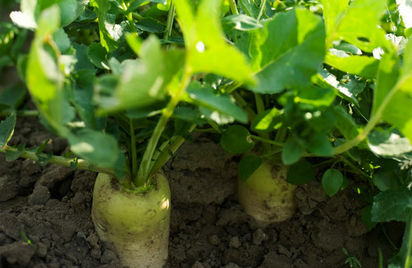 These include parsnips (shown above), carrots and radishes. When you plant the seeds you have to be very patient and wait for the green shoots to grow big and leafy above the ground. It’s important to wait – NO PEEKING – because if you pull them up too soon you will break their little root tendrils and they will stop growing. Other vegetables that grow underground are onions (shown above) and potatoes. These are not quite the same as root vegetables. 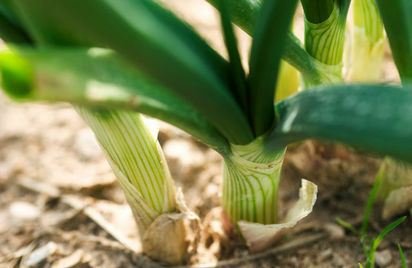 The part of the onion that we eat is a bulb that grows below ground, with small roots extending into the soil and green leaves sprouting above ground. A potato is what’s called a tuber, which forms part of the potato plant’s root system. The illustration above, taken from an excellent website HERE that shows you how to grow your own potatoes, explains the stages of growth and shows you how the potatoes develop under the ground. The second way vegetables can grow is on a vine. 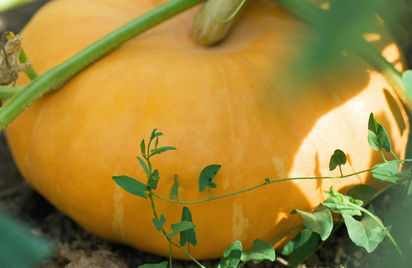 This includes the big, heavy ones like pumpkins, squash, courgette (or zucchini) and cucumbers which lie on the ground, and also smaller, lighter ones like peas, beans and tomatoes (technically a fruit) which can be supported with poles or nets to help the vine grow upward. Each of these vegetables is actually a seed pod, and you can easily see that when you open them up. Think of how many little seeds are inside a tomato, or how much slimy goop full of seeds you have to dig out of your Hallowe’en pumpkin! The third way vegetables grow is sprouting up above ground with strong roots holding them up. 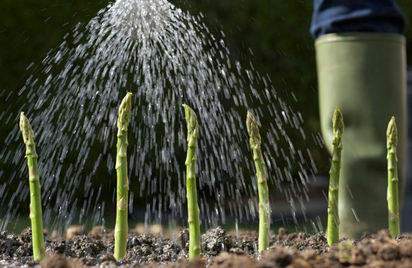 This is true of asparagus, shown above (something I didn’t know! ), leeks, broccoli, cauliflower, lettuce, cabbage and Brussels sprouts. 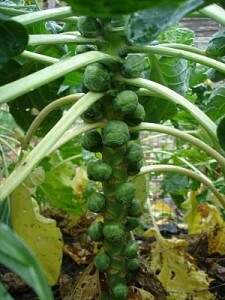 I found another fun website called Secret Seed Society that shows how Brussels sprouts grow on big stalks. I think they are the weirdest vegetables I’ve seen yet! 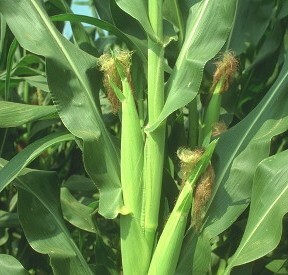 Another vegetable I can think of that grows on a big tall stalk is sweet corn. When I was young I used to love eating corn-on-the-cob smothered in butter and salt! We would buy them fresh from the market, and I always liked to help peel back the green leaves and the stringy hair at the top. Like vegetables that grow on vines, corn cobs are made up of lots of seeds (the little yellow kernels that we eat). These are the same kernels we use to make popcorn. Most of the vegetable photographs I’ve used above come from Chanel 4’s website, Grow Your Own Food. Take a look at all the amazing things you can grow, even without a garden! Now, “What about fruit?” I hear you say. Most of the fruit we eat is grown on trees. It is also full of seeds and is designed to fall from the tree and decay, allowing the seeds to take root in the ground to make a new plant. Before that can happen, we gather up all the fruit and eat it ourselves, throwing the seeds away! Perhaps next time you eat some fruit you should save the seeds and try and plant them. 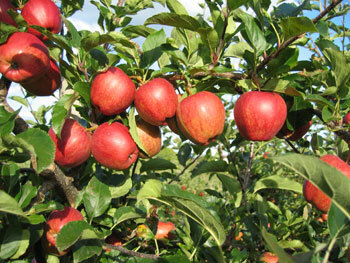 Above you can see some yummy looking Gala apples from Aston Fruit Farm in Herefordshire. Most fruit trees are fairly small (which makes picking the fruit much easier!) There are hundreds of varieties of apples alone. Other fruits that grow this way include oranges, grapefruits, lemons, limes, clementines, tangerines, pears, plums, pomegranates, dates, figs, apricots, cherries, peaches, and many more! Other fruit you might enjoy grows on a vine. I was quite aware that both green and red grapes grow this way, but I was very surprised when researching this topic to find that kiwi fruit does too! 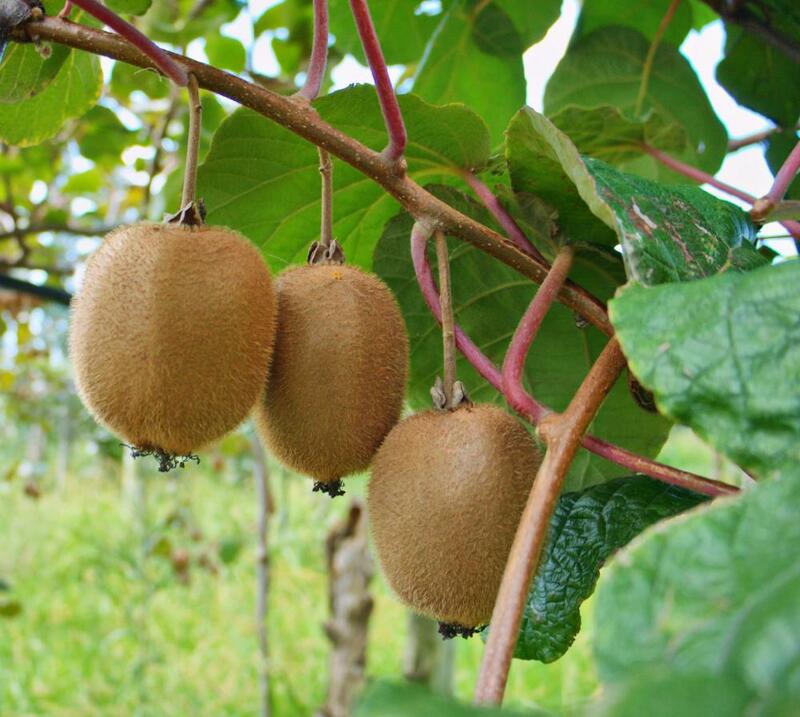 The picture above came from Wisegeek.com, so if you want to know more about kiwi fruit just click HERE. There are other vine fruits that can get quite big. These include all sorts of different melons, including gallia, canteloupe, honeydew and of course the biggest of all, watermelon! Another type of fruit you might wonder about is the berry. These usually grow on bushes, so they make picking easy! The strawberry photo above comes from Bullscroft Farm, where you can pick your own if you like. I remember picking strawberries when I was a child, and it’s quite hard work bending down for hours. 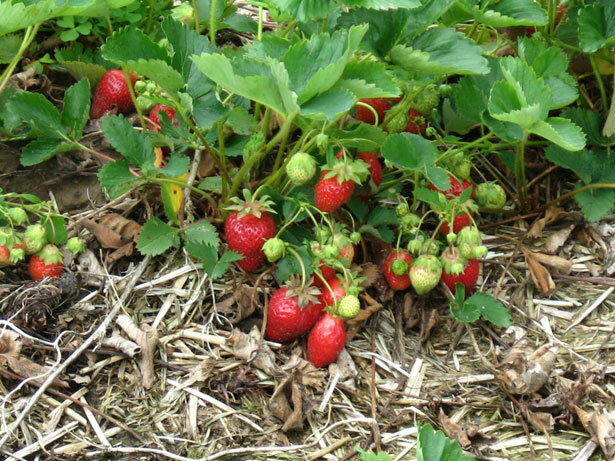 Back then I didn’t like strawberries, so I wasn’t even tempted to nibble on them as I picked! You can also pick raspberries, blackberries, gooseberries, boysenberries and logan berries, which grow on taller bushes, but watch out as some of them are prickly! 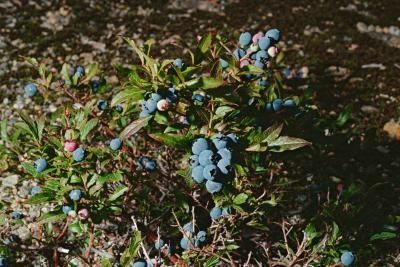 Blueberries also grow on low bushes, and they are very delicate so it’s especially hard to pick them. Often you find blueberries baked in muffins, but they are even better when you put fresh ones on cereal or ice cream. The last fruit I want to show you is one that grows on a small bush but is very different from any berry. I saw this in the Amazon and had to take a picture because it was so surprising! 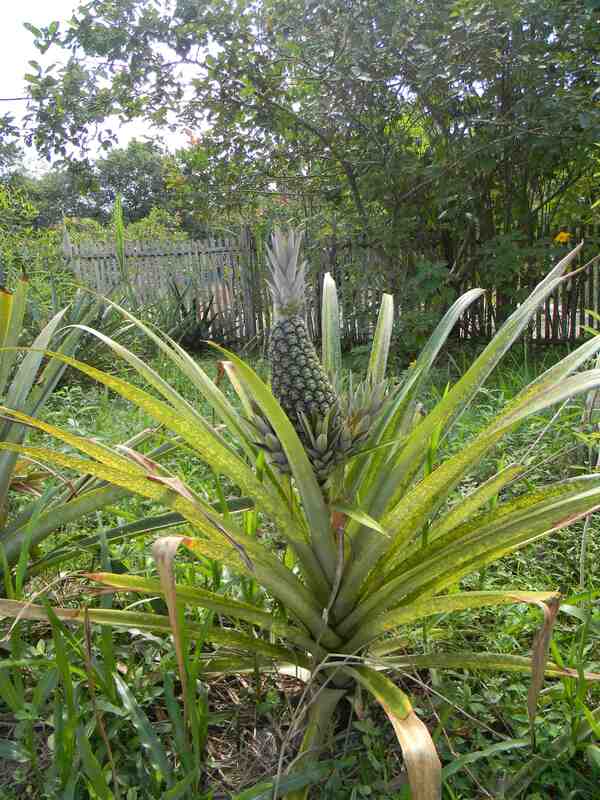 It’s one of my favourite fruits, and it grows on a very spiky bush. The pineapple! 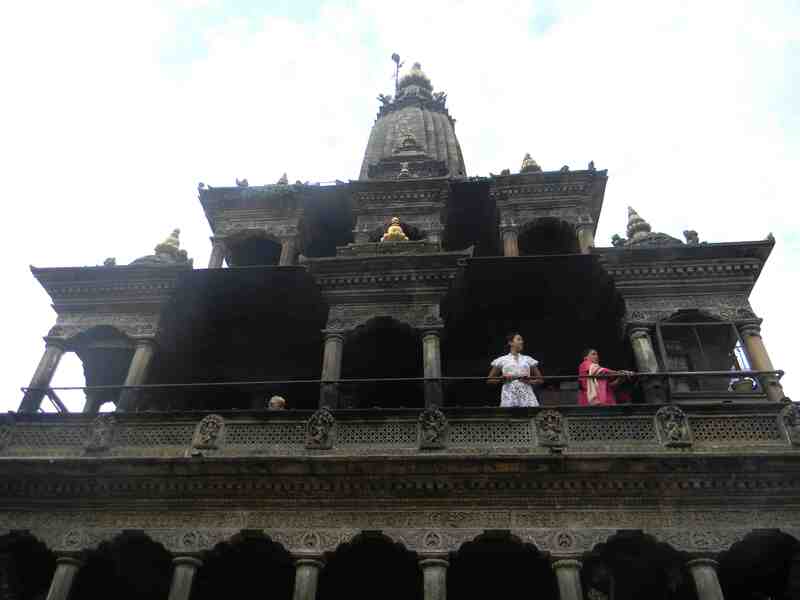 A while back, my husband took his first trip to Nepal. Although he had visited both China and India several times, he had never managed to explore the small and mountainous country sandwiched between the two. He flew into the capital, Kathmandu, a busy and crowded city surrounded on all sides by mountains. Long ago (in the 15th century) the Kathmandu Valley was divided into three separate kingdoms or city states: Kathmandu, Patan and Bhaktapur. In each city state the ruler built a handsome palace, surrounding it with a public square, ornate temples and statues on tall plinths. 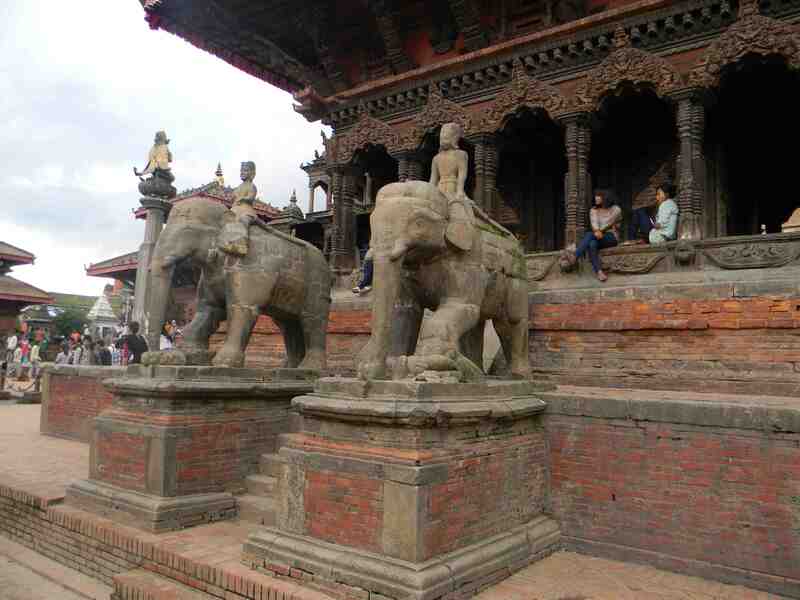 These three squares still exist today, and the most famous of them is Patan Durbar Square. (If you look on the map above, Patan is just south of Kathmandu across the Bagmati River). The most important building in Patan Durbar Square is the Royal Palace which is enormous and stretches along the east side of the square. Above you can see one of the entrances to the palace with two carved stone elephants. Across from this entrance is the Krishna Mandir temple. While most of the Buddhist temples and indeed the Royal Palace are constructed of red brick and timber, this Hindu temple is unusual in being made of ornately carved stone with accents in gold. While my husband was visiting the square, he noticed lots of people in colourful costumes. It turned out they were making a Bollywood film! In this picture you can see some of the dancers relaxing during a break on the steps of the temple. 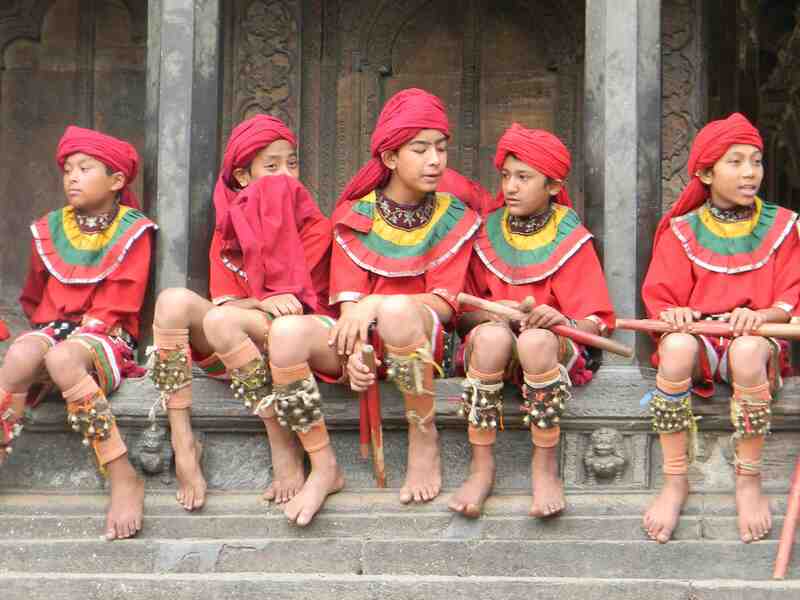 They have bells on their legs and bamboo pipes to play, so I’m sure their dance number must have been brilliant! 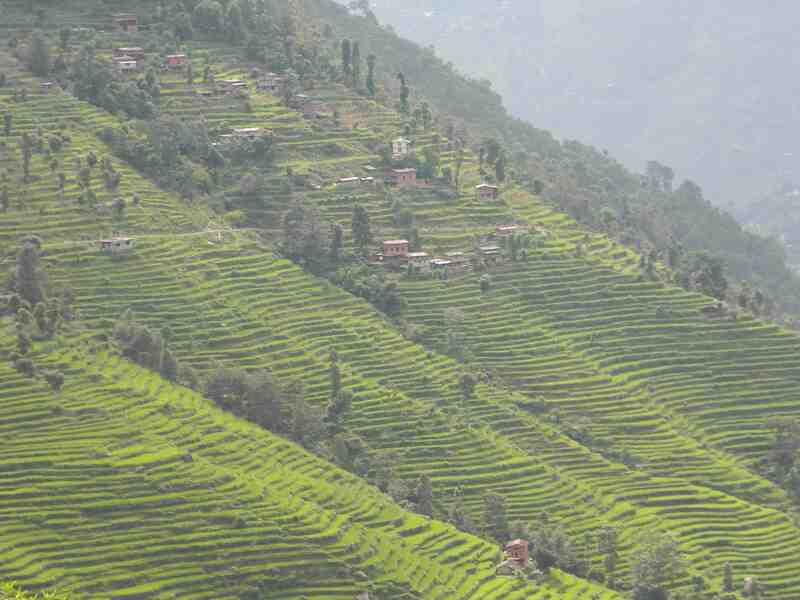 The next day, it was time to climb into the mountains and visit a small village called Chokati. It was a long trek, and the views were spectacular. At one point they came to a deep valley with a river rushing past far below. The only way to reach the village was to cross a rickety suspension bridge with quite a few boards missing! I’m glad to say the group made it safely across and managed to reach the village. As they approached they could see little houses perched on a steep green slope. Chokati is an agricultural community and the main crops they grow are rice and corn. Up close, the houses are very simple. This is where my husband stayed during his time in the village. 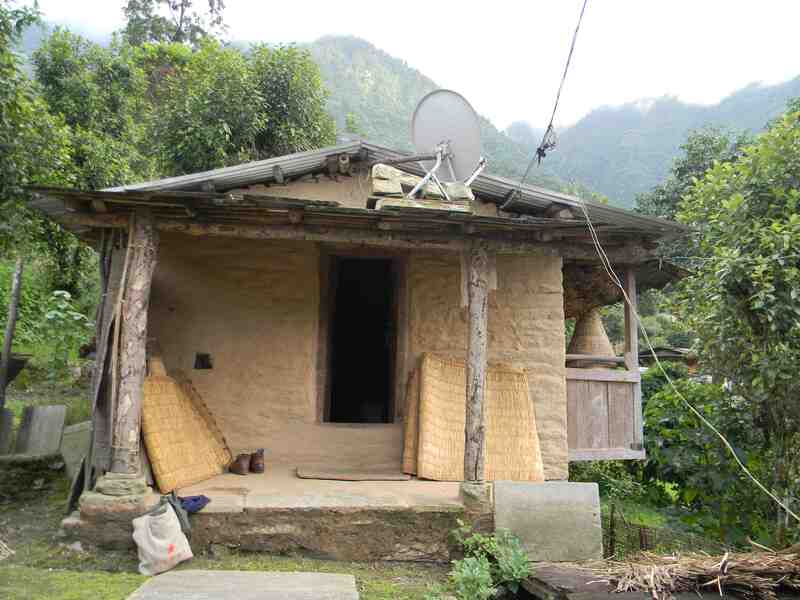 Although they have very few possessions, you can see they still like their satellite TV! 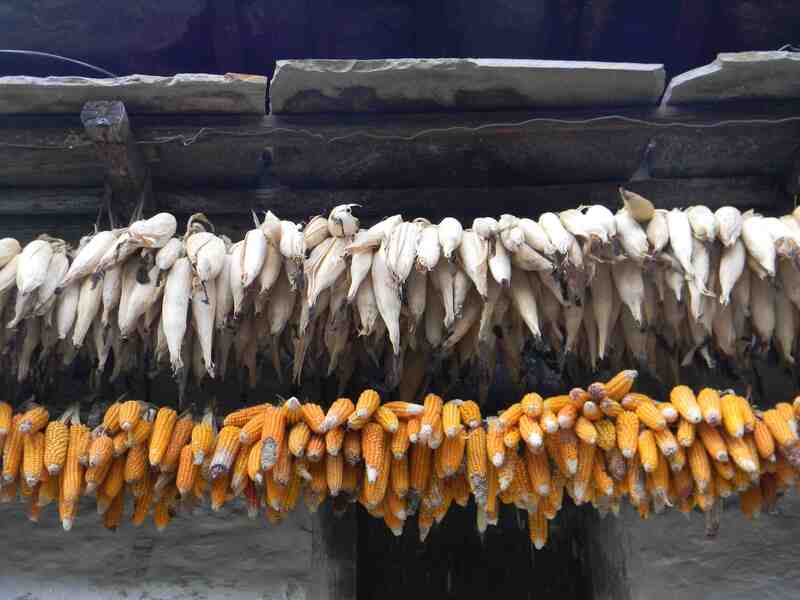 Here is a picture of some corn drying outside one of the houses. The ones strung across the top still have their husks. Once they are dry the kernels of corn can be ground into flour to make bread. My husband received a warm welcome in the village (which included having a red mark painted on his forehead and a lovely garland of flowers placed around his neck). The most colourful character in the village was the medicine man, or shaman. 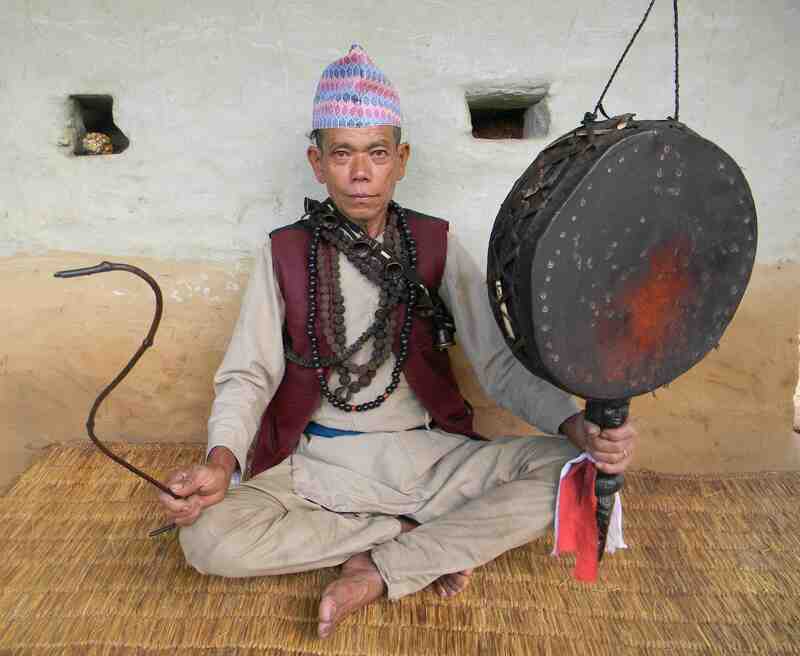 This ancient practice dates back 50,000 years, and when someone in the village is ill the shaman will perform a drumming and chanting ritual to call upon the spirits to help heal his patient. In the photo below you can see the drum made of animal skin stretched over a wooden frame, and the curvy stick the shaman uses to beat it. As always, my husband felt he had to come home with a souvenir of some sort, and he found the perfect thing: a traditional Nepalese trumpet which can collapse down like a telescope, fitting perfectly into his suitcase! It’s made of hammered metal, about one metre in length, and if you want to see what they sound like, have a look at the short video HERE. Thankfully, our trumpet is never played – it’s just a very handsome ornament!